My New York culinary adventures continue with a visit to Carmine’s in the theatre district. 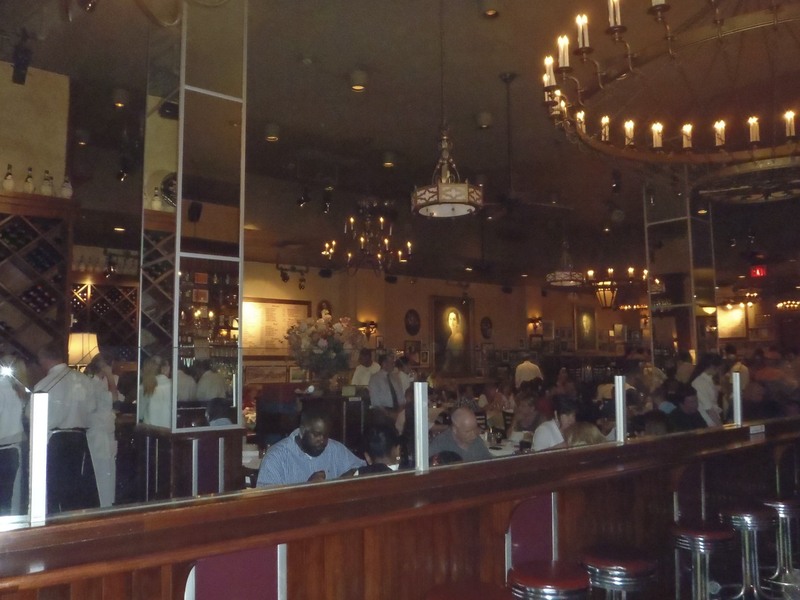 Carmine’s is a family-style Italian restaurant. 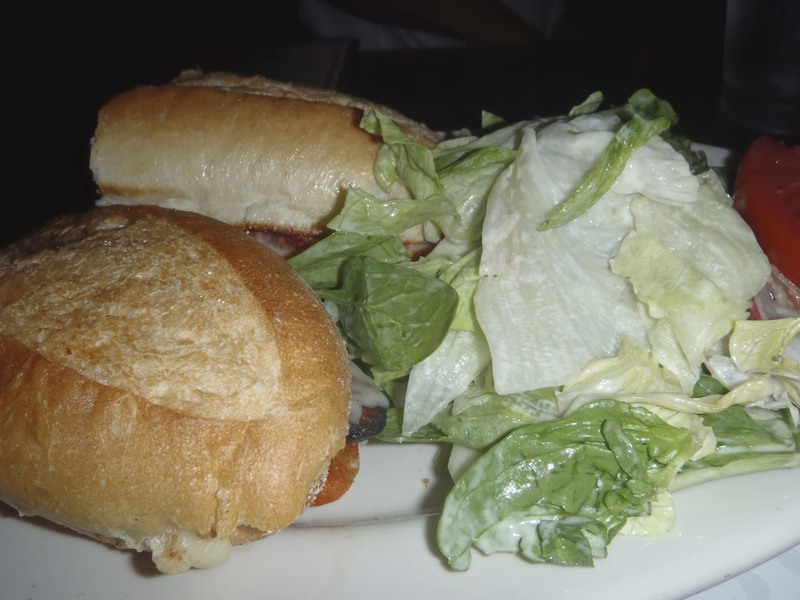 What I mean by that is that Carmine’s focuses on dishes that are created to share and are not too expensive. The portions are massive – It reminds me of large family potlucks where everyone creates one large dish for everyone to enjoy. The restaurant has been opened for only 20 years, but it has the feel that it has been there forever. 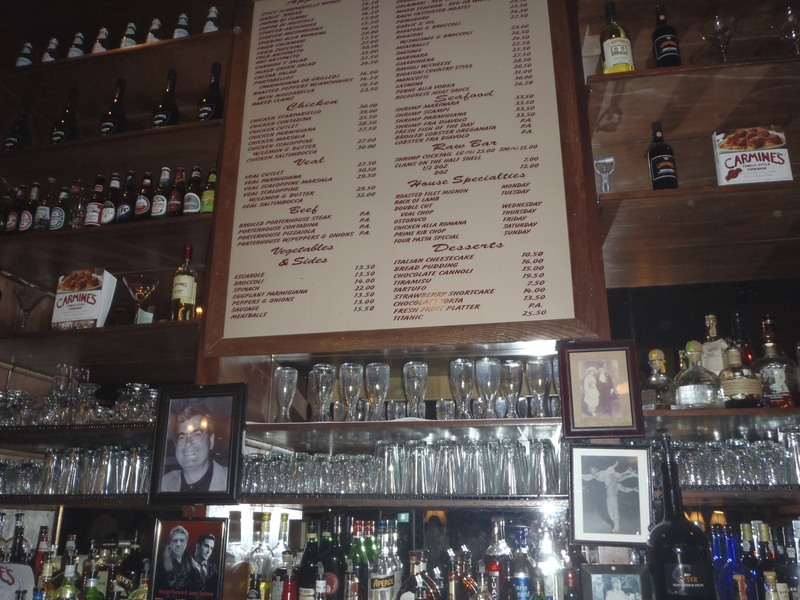 Antique photographs and portraits adorn the walls and the massive wood and brass bar has the look and feel of a well-worned spot. Being that I was on my own, I decided to sit at the bar. My server was amazing, so attentive and friendly, I felt that I was having lunch with a friend. 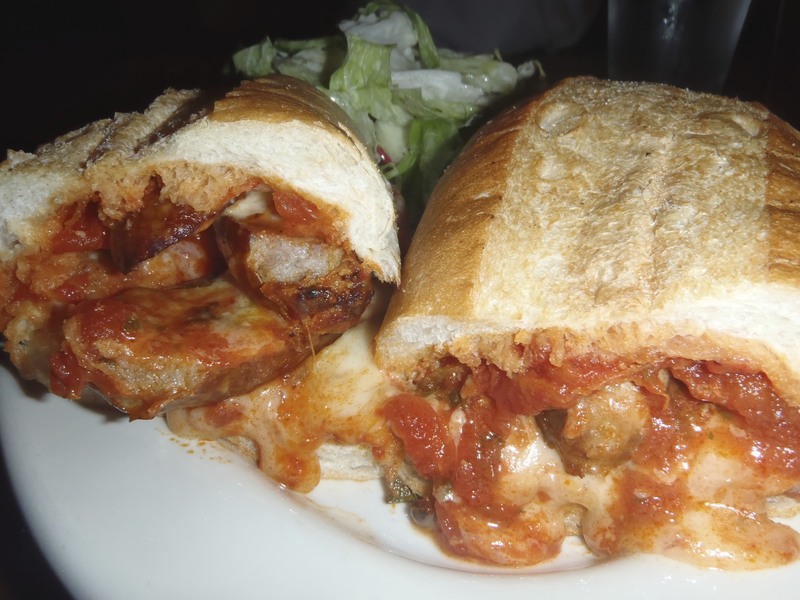 He suggested that I order an item from the bar menu, so I chose the Sausage and Peppers Hero Sandwich (11.99) When that thing came, I couldn’t believe my eyes! It was huge! so massive, and for $11.99? crazy. I took a bite I was in love… spicy sausage with ripe, crispy peppers, covered in a delicious tomato sauce that was sweet and tangy at the same time. All of these ingredients where held together by the most gooey, melted mozzarella that you’ve ever tried. It was nothing less than expectacular. The bread? warm, crispy. There isn’t a single thing I would change about this sandwich. It was a master piece. 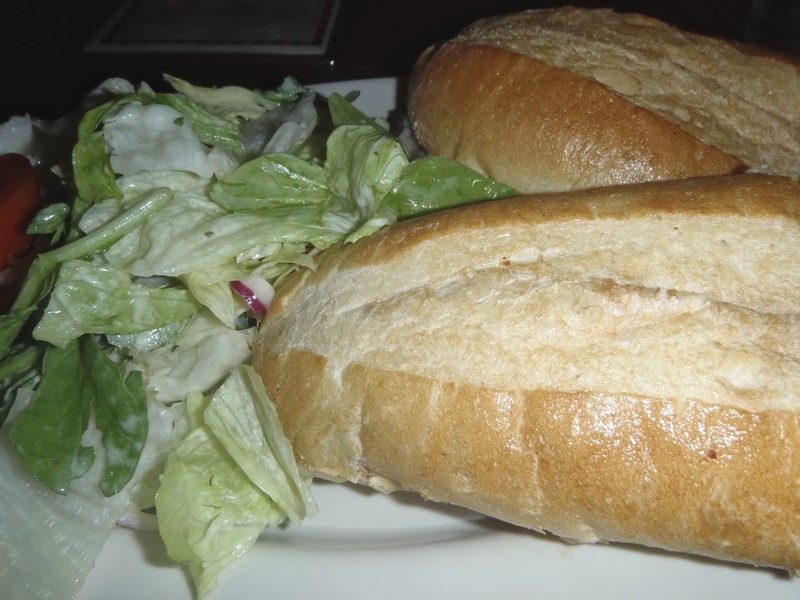 It also came with a salad with romaine lettuce, tomatoes, cucumbers and green onions on a very tasty, creamy dressing. 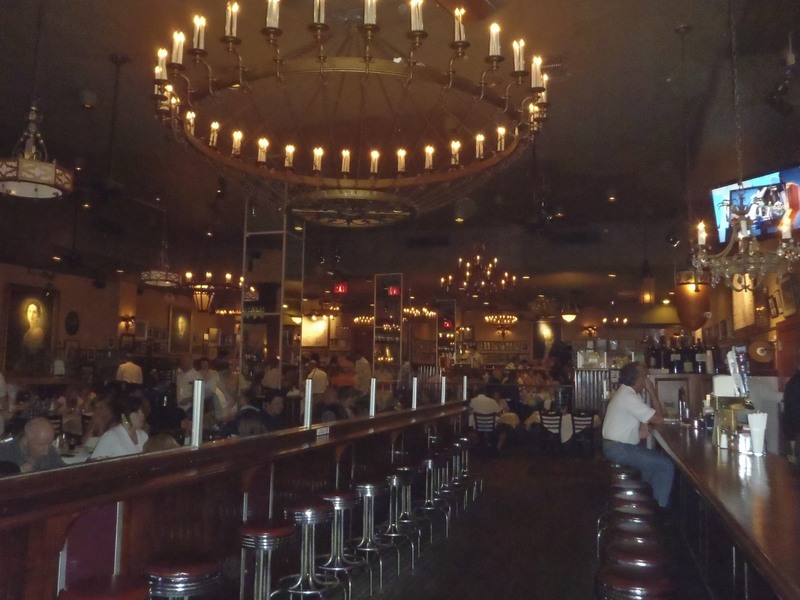 Carmine’s has an excellent wine and beer list – I choose a pint of the Brooklyn Pennant ($7) an amber ale with citrus notes. So delicious. I would love to come back to this restaurant with a large group of people, I would love to be able to taste some of their dishes and have a wonderful meal with my friends. Great atmosphere.